Want to make a chalkboard for your kids? It's just paint you can find at Home Depot or Lows. The best part about it is that all you have to do is paint over it when you don't want it anymore! We made this chalkboard for our preschool kids and they LOVE it! 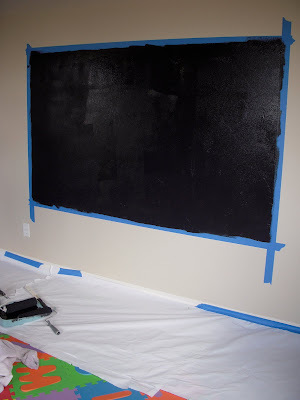 First you need to tape off where you want to put your chalkboard. We pretty much put ours dead center on the wall. Make sure you put paper over your carpet and baseboards just to keep them paint free. Then just paint away. We used two coats of paint. Then let it sit and dry for 3 days... Some people say to take the painters tape off immediately to avoid pulling off paint you don't want pulled off. We kept ours on there and it was fine. i totally need to do that!! how is your preschool coming along?